More blue – still simple, clean, with silver accents. And even winter clothing can reflect the beauty of this painting. 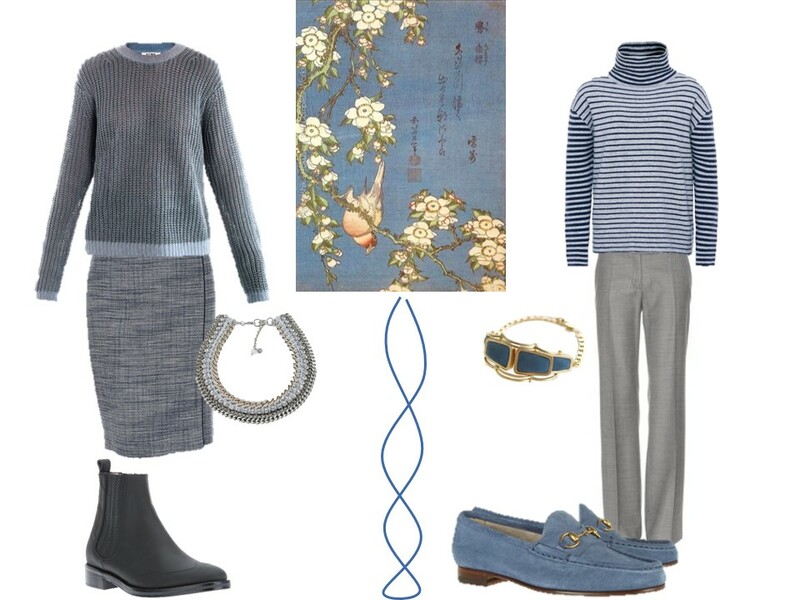 Soft sweaters, tweed, suede, all capture the gentle grace Katsushika Hokusai brought to life here. Are you turning your attention to winter already? I'm always thinking of winter – it's my favorite season. 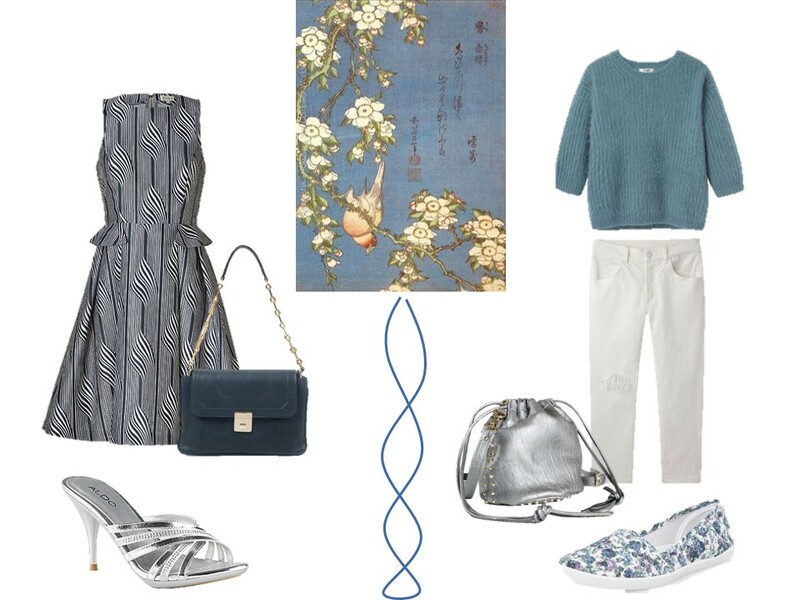 But here I show sweaters and tweeds more to demonstrate that, even though the image and the colors in it are all about summertime, it's possible to extend their inspiration to the colder weather. I love the ease of it. 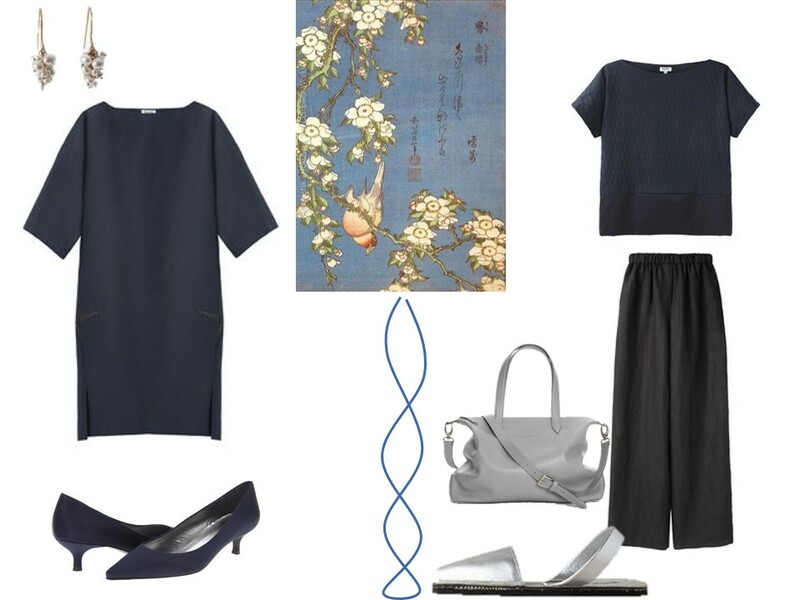 Once you've chosen your signature, be it a painting, or some other aesthetic theme, shopping and getting dressed is just like pulling on another layer of your own skin – it's just that natural and comfortable for you. How does one know which 'one' is it? I see so many things that I like, especially here LOL, plus I try to take into account which colors I get compliments on (rather than what I might think I like, but makes me look tired)… At which point is it obvious? Point taken. 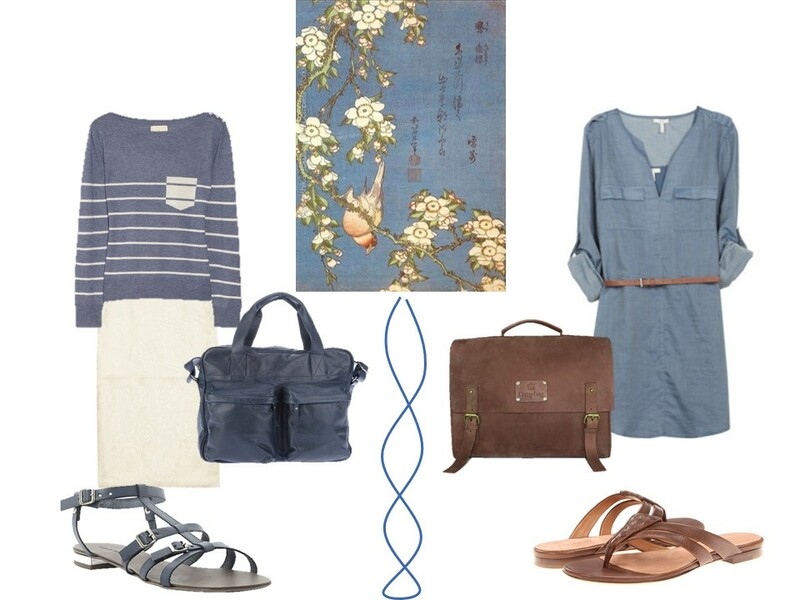 I was browsing your blog list, and saw the chic pragmatist, who has a lovely relaxed style. Very chic, but I couldn't get away with so much grey, as everyone would say I look depressed. I always need a splash of color. That being said, I've learned an awful lot from your blog. I did try the vertical line of color yesterday. Quite slimming. Good tip. Winter is also my favorite season. I have found myself (later in life) leaving pastels for the more satrurated colors during warmer months…and I am constantly inspired by art…I always get great ideas from a museum visit. This one would be the best scarf! Love these looks!In order to find what makes our heart sing, we can't be in a hurry..we must take the time to shop and scrutinize the mirror…if it sings in the dressing room in front of a three way mirror..it is a go! Very nice colour ways and simple designs. Could wear it all. Speaking of chambray, I decided to buy a fitted jeans jacket a couple of years ago. I wanted a real blue jeans jacket, but the ones I tried looked awful on me because of the color, a color I loved and wore very well in my youth. Bummer! Love this set. All of it. As Lisa said – love it, all of it. Beautiful. I think I could be VERY comfortable with ALL of these – thanks for great ideas !